Peach season is frustratingly short — that is, that brief period when fresh peaches from your local area are available, not the perfect-looking fruit that’s shipped across the country hard as rocks. These ripen into mush, often not very flavorful mush as well. Look for peaches at your local farm markets that already have some give when pressed lightly. They’re just right for making fresh peach chutney. 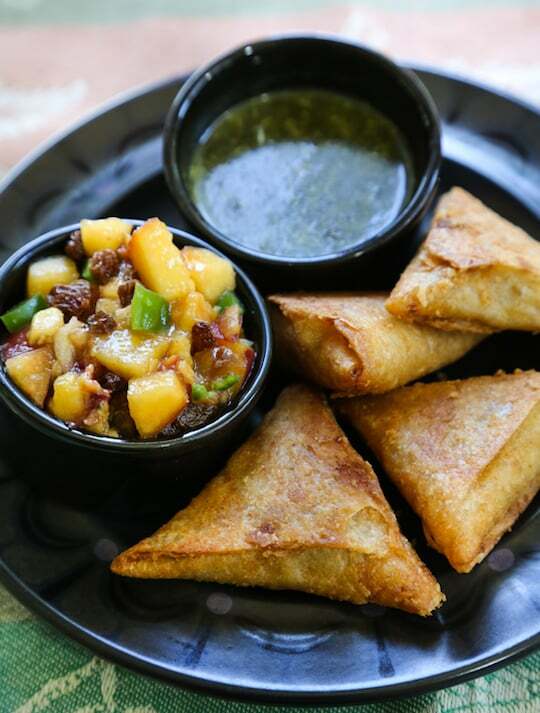 Lots of chutneys are cooked down, but why go there? 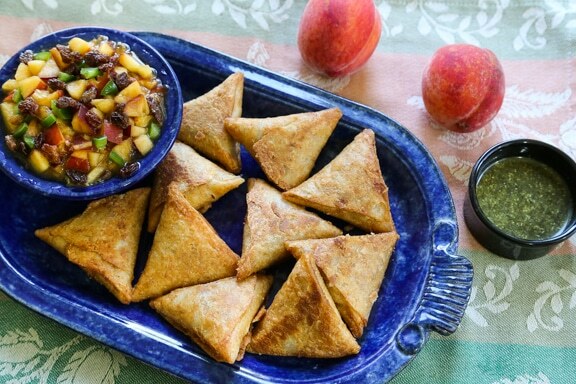 This combination of fresh fruit (nectarines are just as good here as peaches) and chile peppers strikes just the right balance of sweet and spicy, making a fantastic relish to serve alongside grilled vegetables, curries, and samosas (we used frozen samosas for this delicacy — no way we could have made better ones from scratch!). Pit the peaches and dice them into approximately 1/4-inch dice. Combine with the remaining ingredients in a small mixing bowl. Allow to stand for about 15 to 20 minutes. If the mixture becomes watery, drain in a mesh sieve. Either way, taste and adjust the vinegar and syrup balance. Serve at room temperature. Store leftovers in a tightly lidded container, in which it will keep for a few days in the refrigerator. 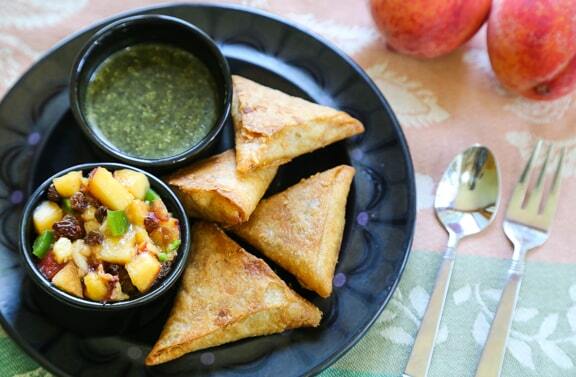 I made these with pluots (from my CSA box) and the chutney was fantastic. The ginger really melded well with the fruit. I used jarred minced ginger but next time I will try fresh. I used pineapple vinegar instead of cider as it was on hand and has a less biting taste. The pineapple flavor compliment well the chopped dates. (Pineapple vinegar is a Mexican product.) This chutney tasted great with the additional of halves green seedless grapes added right before serving. Next time, I will omit the jalapeno to appeal to our household’s more sensitive palate. Thanks Nava, I am planning to memorize this one.